A former employee filed a whistle-blower lawsuit Friday against BP, claiming he was fired over concerns he raised about cleanup efforts in the Gulf of Mexico. August Wilson, fired from a “state planning lead” position on the Mississippi cleanup, says that the oil company only cleaned up tar balls, ignoring other, smaller oil debris. 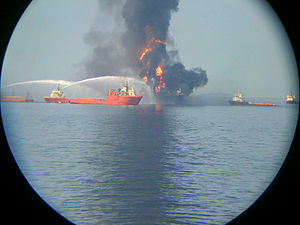 In Walter’s suit, the allegations are limited to BP’s cleanup in Mississippi, but the company had similar plans in Louisiana, Alabama and Florida after an April 2010, blowout in triggered an explosion on the Deepwater Horizon drilling rig, killing 11 and leading to the worst offshore oil spill in the nation’s history. August Walter, Ex-BP Worker, Files Whistleblower Suit Over Gulf Cleanup.